We invite you to enjoy the elegant accommodation at the Shangri-la of the South Coast of NSW, nestled at the foothill of the picturesque Cambewarra Mountain. You will relax and share the sheer elegance and beauty of this 20-acre sanctuary. Take a stroll in the gracious manicured gardens to smell the roses at Garden Hill. Gaze and be amazed at the emerald green parkland setting from the gazebo. Watch and hear the wild birds duck in and out of the lake. Play a game of tennis and enjoy a dip in the in-door swimming pool. Relax with a game of croquet. Relish a spa bath in the Magnolia sandstone cottage. Garden Hill is within minutes of the historic town of Berry, which boasts of a vibrant village culture of posh shops and swanky restaurants amidst a gracious rural setting and friendly community. The historic Coolangatta Village will intrigue you with its fascinating history.The Shoalhaven Heads boasting of a foreshore walk, bush walk and beach walk awaits you. Enjoy the experience of wine-tasting at the four wineries: Two Figs, Silos, Mountain Ridge and Cambewarra. Savour great food at South on Albany at Berry and the Blue Swimmer at Gerroa. 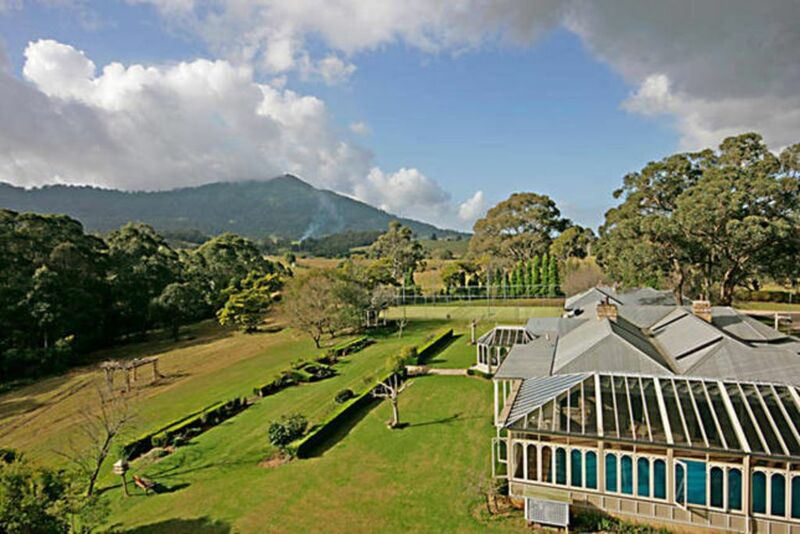 Visit Arthur and Yvonne Boyd's gift to the nation of their properties, Bundanon and Riversdale along with an extensive collections of many forms of art. Be enthralled by the pure magic and country comfort of the Magnolia self-contained sandstone spa cottage. Enjoy the view of the Cambewarra Mountain and the beauty of the magnolia, roses and prunus from your bedroom. Listen to the twittering of the wrens and laughter of the kookaburra. Enjoy your romantic rendezvous and have a completely soothing stay at the cosy self-contained sandstone Garden Cottage, consisting of a bedroom, sitting room, spa bath and kitchen (oven, cooktop & BBQ). Treat yourself to the delicious spa bath. Keep warm and cosy by the log fire in winter. Start your holiday with our complimentary bottle of wine and chocolates for a stay of two nights or more. We are pleased to confirm your reservation on receipt of your full payment. Once the payment has been made, there will be no refund on cancellation or change of dates if you are unable to enjoy the cottage on the dates that you have booked. We have reserved the cottage exclusively for your enjoyment on those specific dates and have rejected all other applications. By making payment, you have accepted our confirmation and no-refund policy. The minimum stay is 2 nights except for the Christmas season which is 7 nights. Garden Hill is sublime beauty and you will have a magical experience at this stunning property. We look forward to welcoming you and sharing our slice of paradise with you. An amazing way to relax and re-energise! Magnolia cottage may look small from the outside but it has everything you could possibly need! Having visited on a very cold and windy weekend, the pot belly fireplace was perfect for keeping warm and cosy! Loved the provision of bread and eggs for breakfast and the complimentary wine and chocolate was an amazing surprise. Spoke to Belinda when we arrived as we were unsure of the check in process and she was more than helpful. Though we met Rosalind only briefly, she was super friendly and accommodating. Location is perfect if you want to explore a few places (which we did) as it is in the middle of Berry, Kangaroo Valley and Nowra. Overall we had a much needed relaxing weekend, my only regret is that we couldn’t stay longer! We are so pleased that Garden Hill Spa Retreat afforded you such a relaxing and restorative stay. Looking forward to welcoming you back again soon! Thank you Rosalind and Nick for our wonderful stay at your cottage. We had the most relaxing weekend away from our busy lives. The cottage had everything that we needed for our stay and the grounds were lovely to wander around. Thank you for sharing your little piece of paradise with us. Hope to come again soon. It is such a pleasure sharing Garden Hill with such a lovely couple. Come back soon to savour my delicious fish curry! Thank you for leaving the cottage in such an immaculate state. Garden Hill is such an amazing place! I had such a memorable time here. My cottage was well furnished and very clean. Loved the nice sand stoned walls in the bedroom and the luxurious bath tub. There is even a tennis court and indoor swimming pool overlooking the gorgeous scenery and lush greenery. Homemade jams were also provided, the marmalade and strawberry jams were to die for! Nick and Rosalind were so hospitable, welcoming and accommodating. We thoroughly enjoyed our stay and would definitely be back again the next time we visit Cambewarra. We are so pleased you have had such a wonderful experience. Garden Hill is indeed sublime beauty and we are thrilled that you have enjoyed our little slice of paradise. Come back soon to enjoy the new two-storey sandstone Connoisseur's Cottage. Play a game of croquet and enjoy harvesting juicy plums, peaches and nectarines in summer! We adored our stay at Magnolia Cottage. It was incredibly relaxing and we never wanted to leave! Rosalind and Nick were great hosts gifting us with wine, bread, eggs and other local produce. We can't wait to return and spend another relaxing weekend away. We are thrilled to have shared our tranquil oasis with you. It was a pleasure hosting such delightful and friendly guests like you. Come back soon and enjoy a game of croquet and campari with us. Overall we really enjoyed our weekend stay. The Magnolia Cottage is very clean and the gardens are gorgeous and the tennis court is immaculate. However, there are a few things that could easily be improved. The owner provides beautiful bread and fresh eggs but instant coffee, longlife milk and jams/honey in jars obvioulsy used by previous guests. Whilst this is possibly more economical, plunger or capsule coffees and small jars of jam would add to the quality of the experience. The welcome bottle of wine and chocolate are a lovely touch. The spa bath is huge and clean. There are plenty of products to use ...but as they were not individual packages but family size bottles, it felt a bit like we were using someone else's bathroom. The bedroom is adequate and the view from the bed just lovely but beware - if you are there on a windy night the doors bang and rattle - although we have brought this to the owner's attention. Also if the (friendly) gardener is out and about it is not very private and certainly noisy. The pool looked lovely but it was too cold (outside) for us to use. Finally note that Garden Hill Spa is about 15 minutes from Berry. It is closer to Nowra. It is lovely to know you enjoyed the gorgeous gardens and views as well as the spa bath. Thank you for your feedback and we have attended to your keen observations. Come back and enjoy the pool in summer!